Igor Iachimciuc was born in the Edinets Republic of Moldova, where he began to study the cimbalom (string-percussion instrument) at age ten at a children's music school. Later, while studying the cimbalom at the Musicescu Academy of Music, he won 3rd and later 1st prizes at the National Competition "Barbu Lautaru". He has also studied guitar and piano. In 1983 he began to study composition at the College of Music in Chisinau, Moldova, where his characteristic folk music influence emerged. He continued his studies at the Academy of Music, composing works ranging from folk, jazz, classical, to new music for solo instruments, chamber ensembles, choir, and symphony orchestra. 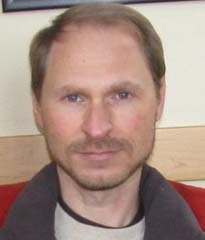 In 2001 he began his music composition Ph.D. work at the University of Utah. Mr. Iachimciuc's awards include 1st prize in composition at the Silver Chrysanthemum National Competition and being named the most promising young composer in Moldova, as well as the 2003 Wayne Peterson's Prize in Music Composition. In 2004 he has been awarded a prestigious Robertson's scholarship. Igor Iachimciuc's works have been purchased by the National RTV Company and performed by various Moldavian ensembles, as well as by San Francisco's Earplay New Music Ensemble, Flexible Music, Canyonlands, and New York New Music Ensemble. Mr. Iachimciuc?s commissions include Utah Arts Festival, Intermezzo Chamber Music Series, Concertino, Duehlmeier-Gritton Duo, and Ars Poetica.